After a couple of successful tests I can now confirm I have 23cms FM capability with the aid of an Icom T81e handy. I have also made a very lightweight bi-quad antenna with at least 10db gain for activations. Can’t guarantee I’ll always have it with me but if you have 23cms and work me on another band, I’d be delighted to QSY and try it. 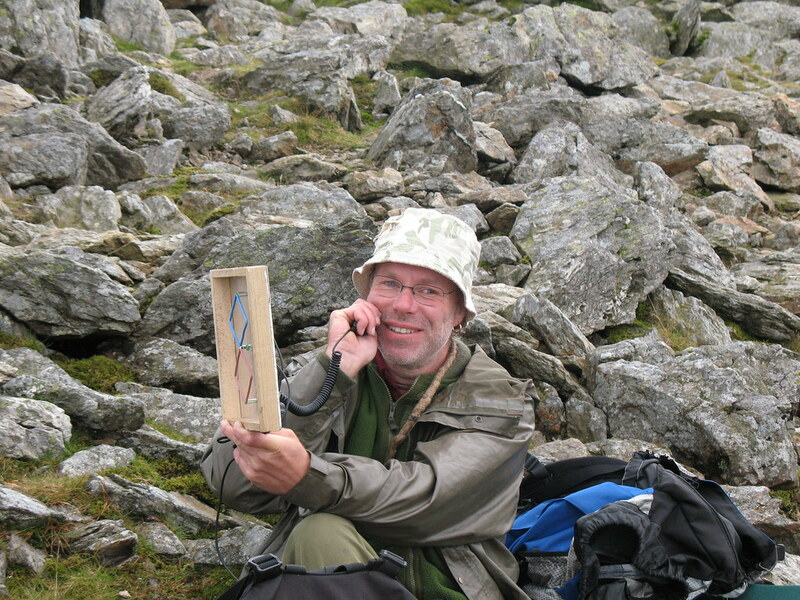 Best DX so far is Mike G4BLH in Nelson, from both Tryfan and Snowdon - thanks for your help Mike. Its nice to have another activator with 23cms capability Ian and it was particularly pleasing to work you on the two summits from my home QTH. There are a few activators with 23 cms capability apart from you and I, including GW4BVE, G6DDQ and G0MJG and there are also some regular listeners. It’s amazing what 1w or less will do on 23cms and high gain aerials are relatively small and transportable. Its a pity that rigs like the IC-T81E are becoming hard to get, but they do appear from time to time. I look forward to many more contacts with you Ian. I’ve got a 23cms homebrew transverter and a 15 over 15 yagi, but have not yet taken this additional weight up a summit. Certainly worth a punt when I can be assured of an audience… i.e. in the area of NW / SP / NP. Maybe when I do something relatively easy such as Tal-y-Fan. Hello to all, just curious about the 23cms band. Having never used it myself I don’t know a great deal about the band, except, I understand that it is very much a line of sight band. As far as sota is concerned, won’t it make summit qualification very difficult because of the line of sight issue? also I should imagine that there are not many chasers with 23cms on board. Interesting stuff, all the same. 23cms is a very interesting band, not necessarily limited to line of sight work. Through high pressure ducting I’ve worked OZ from a Leicestershire hill using 250mW to just 2 inches (1/4 wave) of wire stuck in the antenna socket. However, such conditions tend to occur from evening through the night (often best at dawn - “the dawn lift”), so they are unlikely to be of use for daytime SOTA contacts. Having said that, like Mike, I am always amazed at what can be worked with very little power on the band and with commercial kit now available it is a practical proposition for SOTA, particularly if an activation is posted well in advance. The other alternative is to take the kit up a hill during a 23cms contest, but SSB and a horizontal beam will be required for that. Thanks for the info Gerald. As I said, I have never used or seen the band in action but it sounds interesting all the same. I should imagine that very high gain antennas would be easy to construct and would be physically small for a good gain. I will try and have a demo from Steve GW7AAV now he is back from GM land. I luckily managed to get an Icom T81e handie which has 6m,2m,70cm & 23cm so I don’t have to carry any extra rigs! I am surrounded by hills at home so the only way I can explore the higher bands is out portable and of course a SOTA expedition is ideal because of the height. I also think it’s a good thing if SOTA activators can encourage activity on more diverse bands and modes. I have worked some good distances so far, some not line of sight. It’s more line of sight than 70cms, in the same way 70cms is more line of sight than 2m. A new challenge and loads of fun. I was really pleased when I got four QSOs from Snowdon on 23cms last weekend (as well as working 2m). Just need more chasers monitoring 1297.500 at home. That said, we could do with more people monitoring 433.500 and 145.500 instead of waiting for a sotaspot and then turning the radio on. You don’t need to tie up that expensive YeaWoodCom, just an old PMR sat on the shelf left switched on with the squelch closed will do. Or a cheap scanner.